If you’re planning on enjoying a break from sightseeing to drink a cold beer on a hot day or maybe to enjoy a nicely blended cocktail, you should know where the tops bars in Berlin are. Aside from the sightseeing and landmarks of the city, the drinking culture is a whole other world to see here. Each bar has a unique ambiance creating different experiences for the guest. 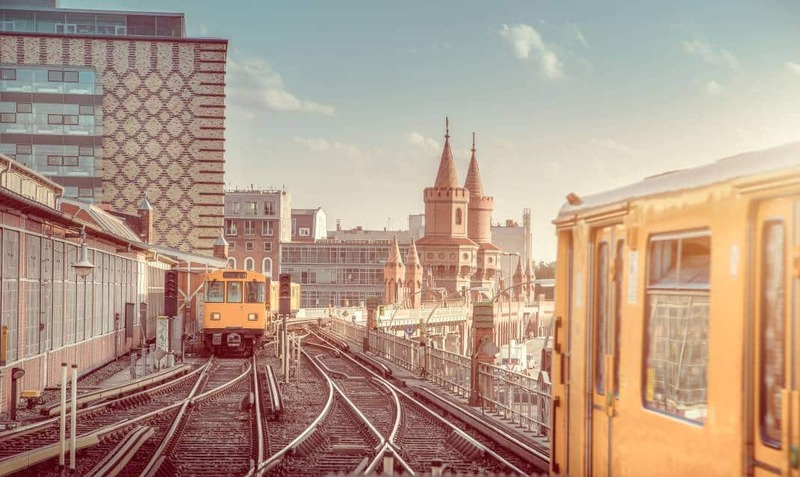 In order to make sure that you spend a nice time in Berlin, you should take a look at these bars in Berlin so that you will know where to drink! Here are 9 top bars in Berlin as a guide of where to drink in Berlin! Each sip of a drink gives a genuine taste, mood, and pleasure. However, when you are in a good place and surrounded by nice people all good effects increase a bit more. Just like when it happens in these bars in Berlin. It doesn’t matter what kind of alcohol you prefer: Beer, wine, spirits, whiskey or maybe a cocktail. Now, it is time to sit back and relax, Prost! Luzia has a great vibe itself both with the decoration and design of the place. Inside you will see it looks kind of ruined with vintage teared up wallpaper and also an old brick wall on the other side. The overall ambiance looks quite quaint but well-juxtapositioned with a more minimalist design with menu an drinks. It is a very popular place among young adults for a beer or a classic cocktail. Especially if you are anywhere nearby Kreuzberg area, Luzia has a great ambiance to spend for a drink with friends or as a couple. Don’t forget some cash as they don’t accept credit cards. #flashback #coffeetime #berlin #berlinhipster ..
Rum Trader is quite a unique bar near Kurfürstendamm. You will have to ring a bell to enter inside and you will be assisted by the owner to the bar. However, you have to mindful about the way that you dress: This is not a casual bar. The bar is here since 1970’s and it is a gathering place for locals. If the owner doesn’t like your attitude, phone obsession or the way that you behave – he might ask you to leave! On the other hand, be prepared to drink the best rum-based cocktails here. Go for a Daiquiri if you are a fan of this Havana cocktail, it is one of the best in the whole world. Within its four walls, Rum Trader feels completely cut off from the rest of #Berlin, or the world for that matter. About the size of a key-making shop, it has maybe 12 seats. More from @robertosimonson on the city’s quirky bar scene, with photos by Andreas Meichsner, at nytimes.com/travel. Did you know you can have a cold fresh beer in the oldest beer garden in Berlin? Prater Garden is the oldest beer garden in Berlin dating back to 1837. The place is especially perfect for a large group of friends, spring or summer meeting at outside. The beers are great and cheap, there are different varieties available. If you want to eat some food along with your drink, the menu is compact yet all things are very tasty including potato salad, grilled sausages or even corn. You can also opt to stay at the indoor restaurant which you might enjoy more dishes too but the outdoor area is a perfect place for gatherings. It’s a budget-friendly bar to enjoy a couple of beers with your friends – so indulge yourself with amazing German beers and snacks! Badfish is another local frequented bar neat Schönhauser Alle. The staff is one the favorites of the visitors of the bar. They are friendly, knowledgeable about their menu including beers and whiskey. Above all, they are very hospitable. In the area of Prenzlauer Berg, you may find many other bars but this one is a total gem all with all decors, staff, drinks and a nice lively ambiance. The craft beer options are great and the staff will let you decide according to your taste profile that you prefer. You can have some late-night beers here and enjoy a delightful conversation with locals or the bartenders. Quality time mit dem besten Mädchen der Welt. Und einem Cocktail ? While you are in Berlin, you might want to get a bit quirky and see more vibrant and lively bars rather than enjoying only a cold beer in a silent corner. This is a small, cozy and a quirk bar located in Kreuzberg area. The music is great as well – from the old-time artists that you would absolutely love. They have an offer on Tuesday which they call “Tu Tu Tuesday”, you get two cocktails or beer for the price of one – which means a long happy hour for you. You should come for cocktails or to spend some time with friends here, with budget-friendly and a vast menu it will still your heart. Berlin is full of surprises and has hidden places and Bei Schlawinchen is one of them. This local famous bar is around since 1978 and it never closed its doors for a break – not even once. The bar is open every day and all day, so if you are out and don’t want to go home until you have one shot or a beer, come here. The interior is quite eclectic inside as there is a bit of everything including cellos or even bicycles hanging from the ceiling. The beer is under 3 euros and you can even get shots for a cheaper price. Don’t come here for a romantic night but make sure to stop by with a funny and lively group of friends! Another great find in the Kreuzberg area is Das Hotel Bar. This bar is has a very romantic and yet futuristic ambiance as it is a candlelit bar. Even the bathroom is covered with candles inside. There are many people coming from all over the world to have a cocktail, spend a good night, relax and sit back to sip a drink here. The cocktails are exclusively great here: Fresh ingredients, amazing presentation, a perfect blend and besides you’ll have a warm welcome by the staff. Das Hotel is open till late, has a very hip ambiance and offers delicious cocktails for a very good price – don’t miss it if you are in Berlin. Botanical Affairs is a gin and tonic bar located in Mitte neighborhood. You might think that you came here to Berlin for here but don’t hesitate to give a shot to Botanical Affairs – they have a huge selection of gins. There are more than 150 gins and over 50 tonics in their collection. People who consider Gin&Tonic as a basic and weak cocktail should come here the enjoy the complexity of aromas with all these different options. Every second week of the month, they hold a Gin Tasting session in the bar with history, production, the gin tasting, finger food, and some other gin-based drinks, if you have a chance to catch you should certainly book a spot. If you are up to the cocktail hype and want to upgrade your experience about them, you should visit Limonadier in Berlin. The bar staff makes their own liquors, syrups, and infusions which you might notice in the menu as well. There is a massive selection of cocktails as well – which you can see the glass of each one on the menu too! The service, ambiance and especially the staff is very amazing here. The cocktails are balanced, tasty and innovative at the same time. You might want to book on a Friday night or during the weekend as it gets very busy and you might not be able to find a table! в #limonadier очень вкусные авторские коктейли ?